I had forgotten what it was like to cycle fast, to not hear the constant rattling of my bike beneath me. The 100km from Alichur to Murghab was effortless thanks to an intense tailwind wind that sent me flying with an icy chill at my back. 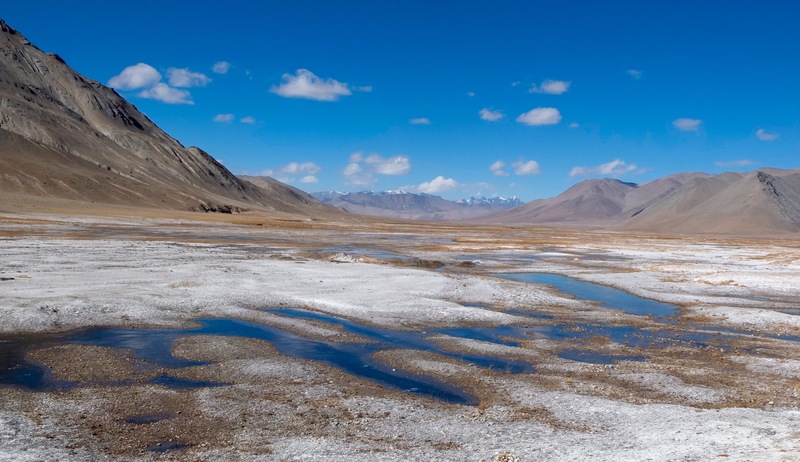 The Pamir plateau has lost its colour and dry brown hills and plains dominated the landscape. After a small climb, I was racing downhill for about 35km to Murghab. 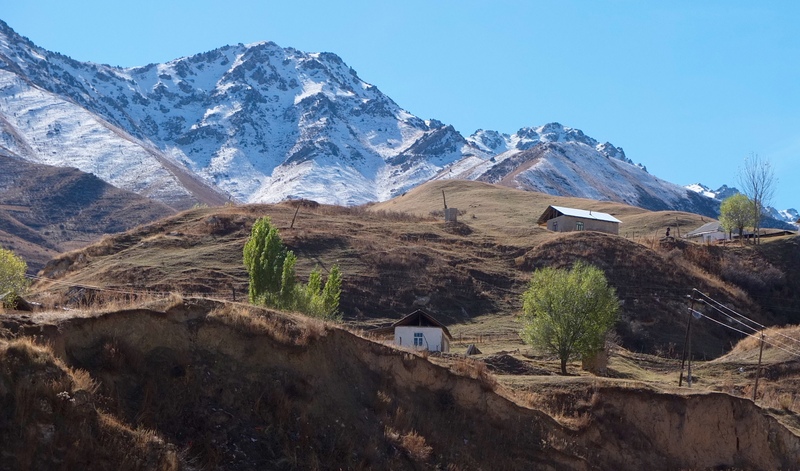 On the way, I passed one small house with a Kyrgyz yurt – a year round homestay. 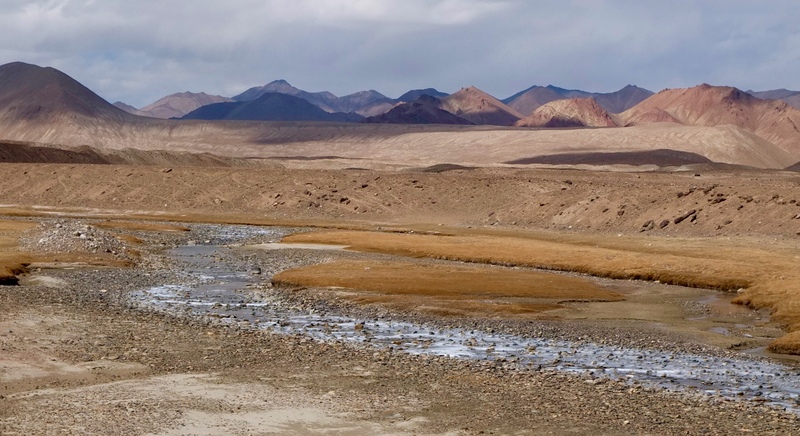 I enjoyed the final 5km to Murghab – the piercing blue river snaked in many directions across a cream -coloured plain dotted with ruins of old homes. I loved the smooth contours of the surrounding mountains defined by the shifting shadows. I came to another police checkpoint below the town. I waited a few minutes, nobody came out and I slowly started to ride past. Then, a man jumped out and told me to stop. Inside I got the usual line of questioning, kids, husband etc. and they asked why I hadn’t stopped right away. I could tell they were trying to fish for bribe. I played the stupid tourist just repeatedly saying that I didn’t speak Russian. Eventually they got bored of my company and let me go. 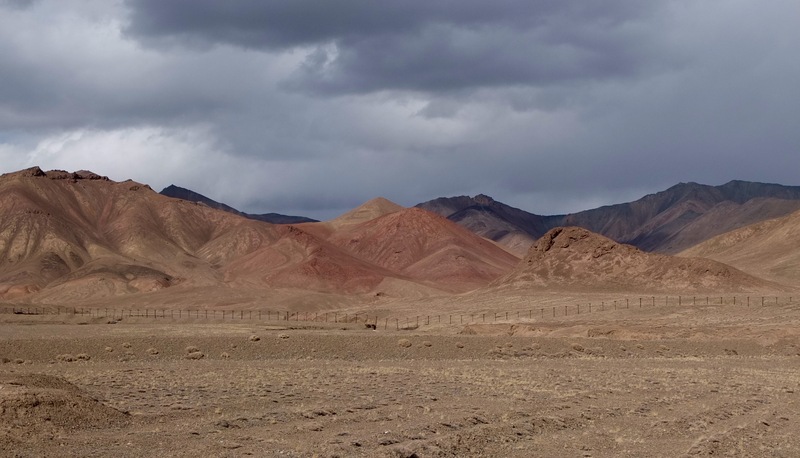 Even though Murghab was decently larger than Alichur, it felt equally desolate. I headed for the Erali Guesthouse that was recommended by my cycling friends Marianne and Heidi. As I pushed my bike up the steep hill, huffing and puffing, a very tiny older woman came out to try and help. This was the lovely “Mama Erali” one of the owners of the guesthouse. By the door there was a girl that looked around my age. “Are you Phoebe?” I asked. 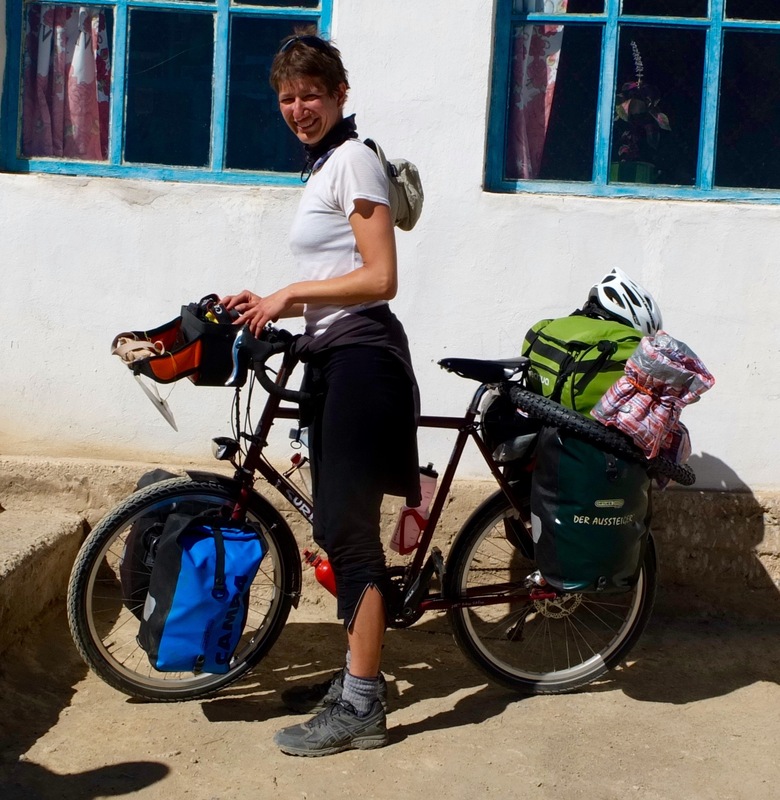 I had heard about a solo Malaysian cyclist named Phoebe that left Dushanbe a few days before I did, taking the same route. Since us solo women cyclists are such a rare breed it was nice to finally meet another. I have only met five in total. Then, Phoebe informed that there was one other German cyclist named Anne staying at the Guesthouse. 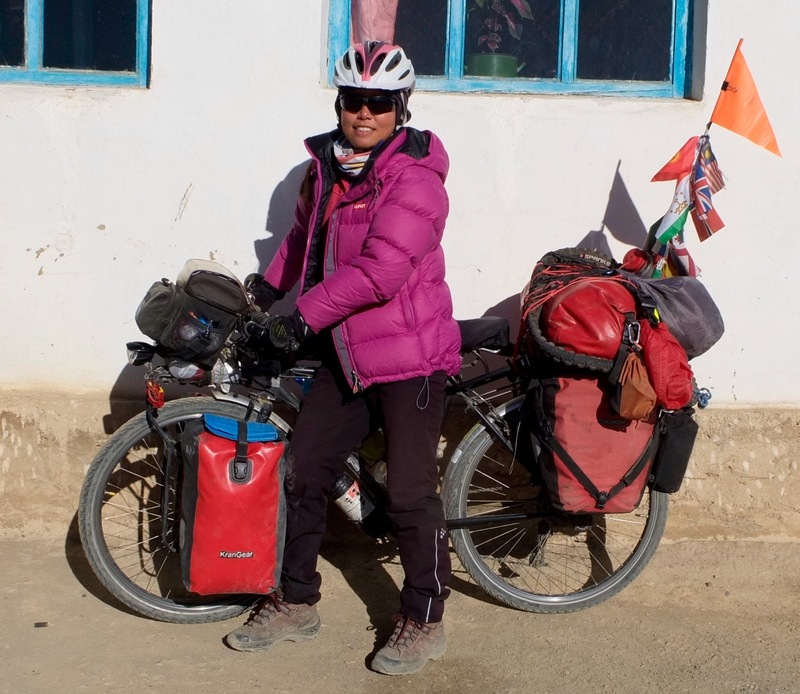 This was a rare and special meeting – the only guests at Erali that night were three solo women cyclists. 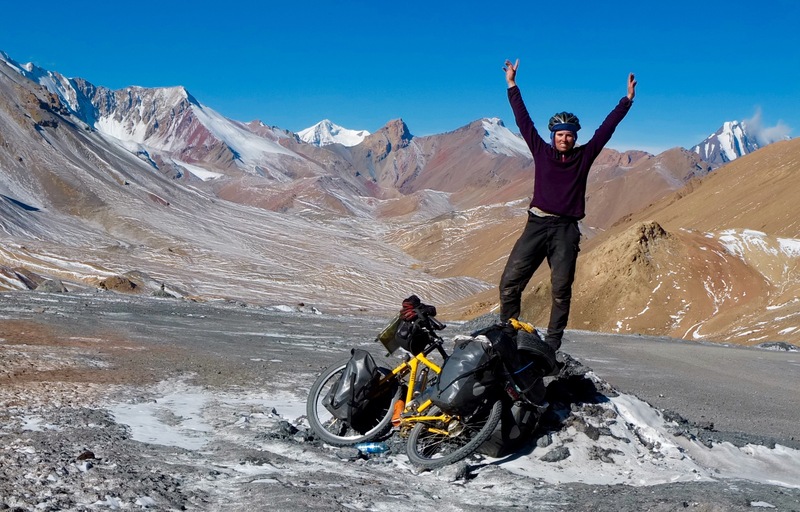 Phoebe left Finland 15 months ago to cycle to Singapore and Anne started her journey in Kyrgyzstan to head West along the silk routes of Central Asia . I really enjoyed their company and the chance to have some girly conversation. I was exhausted when I arrived in Murghab and I have planned to do next to nothing in the next two days. 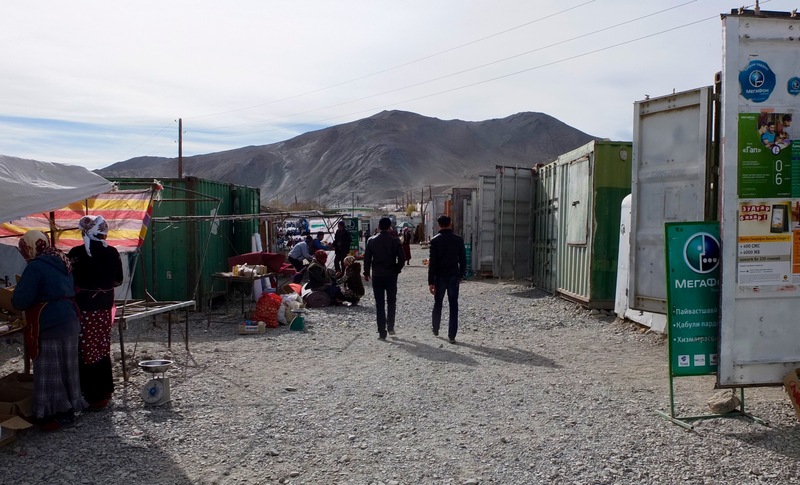 I did get a chance to check out the town’s very strange bazaar, with shipping containers used for shops. On offer was loads of candy, cheap clothing and some of the saddest looking produce I’ve seen. Anne and Phoebe both left after my first night in Murghab, but the next few nights brought more interesting visitors. First, I met a friendly vegan Swiss cyclist (apologize if you are reading this because I forgot your name!) and the following night a man from Seattle, Washington that was living his childhood dream of exploring the Pamirs for a week by car. 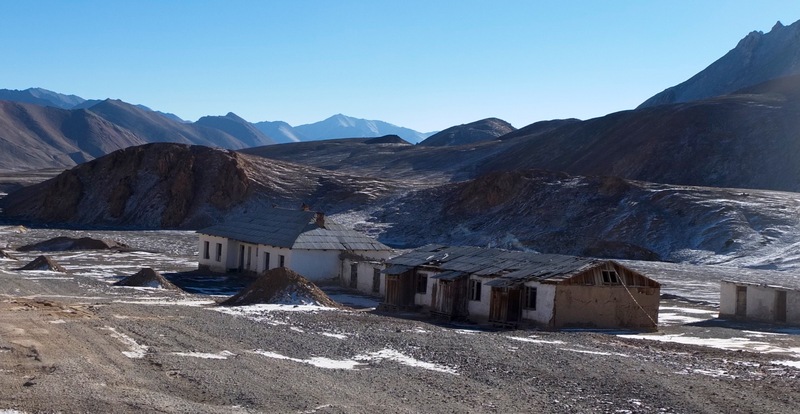 I encountered disaster on my planned final night in Murghab after eating a meal that made me sprint outside into the frigid night and throw up all over the steps. Cycling was off for the next day. I was warned about food poisoning in Tajikistan and I had managed to evade it until now. I really though that five weeks in India would have sufficiently toughened up my stomach. 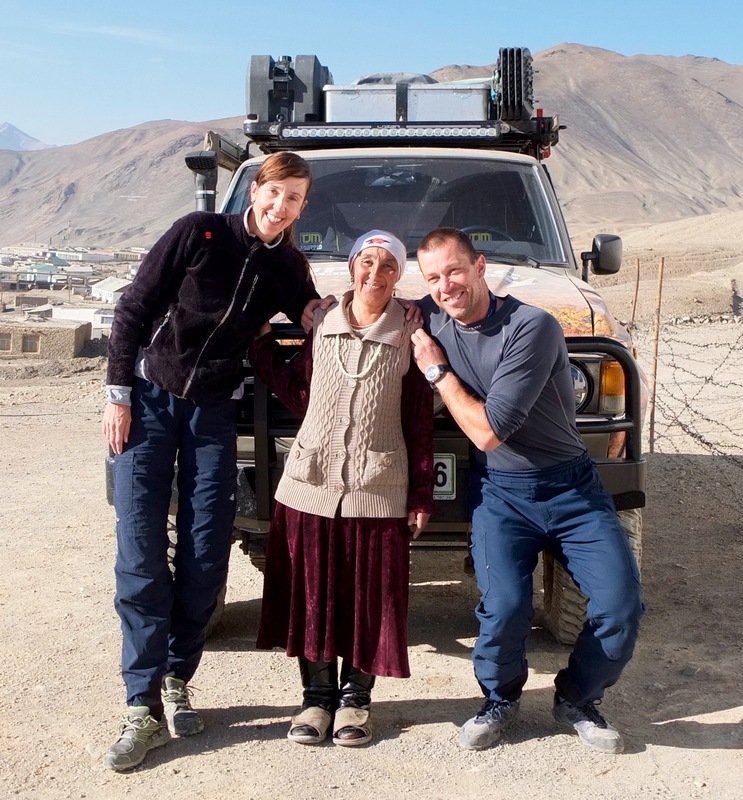 With my extra day off I ended up meeting an energetic and hilarious Slovenian couple -Renata and Matjaž that were driving across Tajikstan in their own 4WD from home, headed towards Uzbekistan. 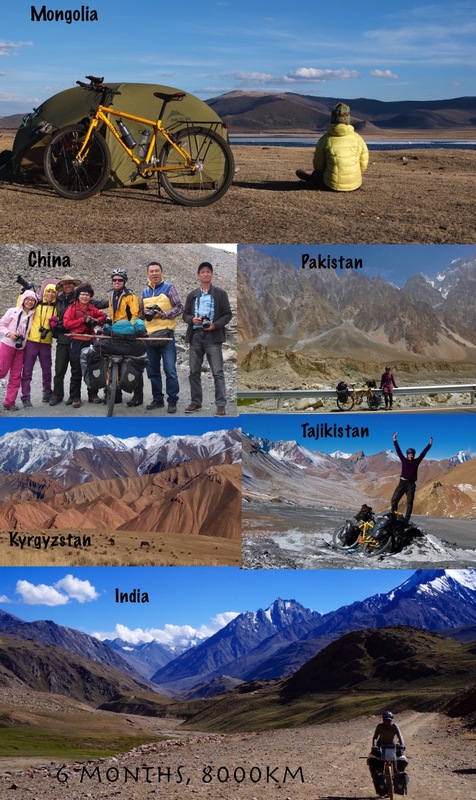 They had done countless road trips together in some of the most remote areas of Asia and Africa. By now, my bout of stomach sickness seemed to have passed and I was ready to hit the road again. 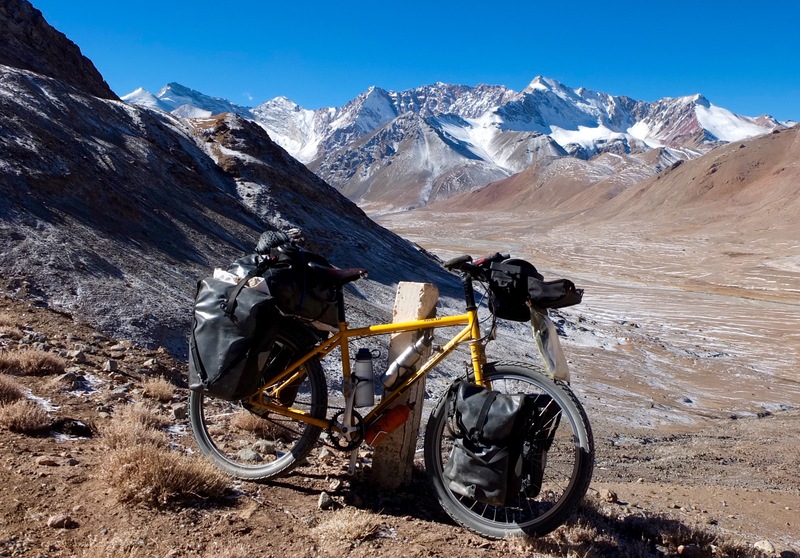 I was headed towards the highest point of my Pamir ride, the 4655m Ak Baital pass. With the temperatures dropping rapidly I feared that I would hit snow at that altitude. The daytime temperatures remained quite pleasant for cycling, but the nights had grown too cold for camping. At this point I would try to avoid it if possible. 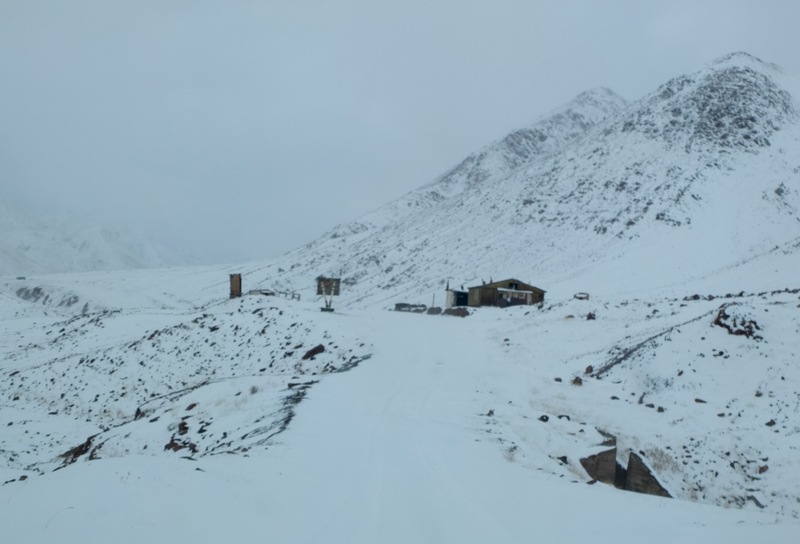 The road started to gently ascend from Murghab, taking me past rivers that were now coated in ice. I passed an army vehicle with a couple of men standing around. “Chai! chai!” they said, and I decided to stop. I guess “chai” could take on many meanings, because I was handed not a cup of tea, but a stiff drink of vodka. Why not? I figured – it could add some amusement to the climb. By the 3rd cup though, I had to decline, if I wanted to not end up in a ditch 100m down the road. They also shared some bread and salami with me before quickly seeking shelter in the vehicle out of the cold. I asked them how far it was to the pass and they said 20km. 20km – “nothing!” I thought. For the first time since Dushanbe, about three weeks ago, I had a headwind. I was over confident that I could reach the pass in the same day without a huge amount of effort. Fatigue started to set in. Dark clouds swirled ahead and I worried about being caught in bad weather on the pass. 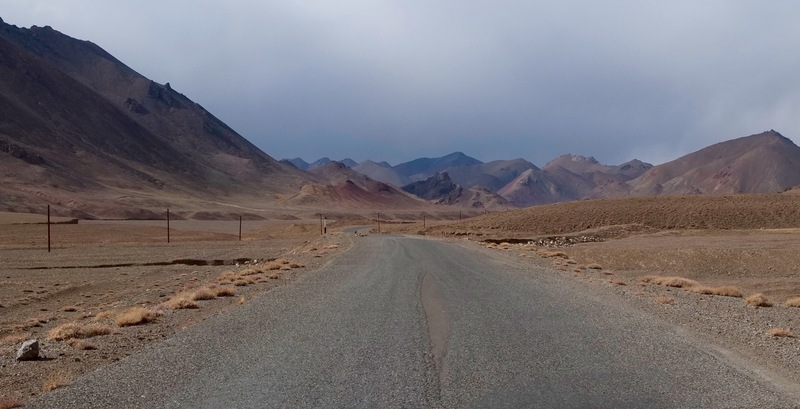 I was told that the stretch from Murghab was quite remote and the chances of being able to hitch a ride if necessary were very slim. About 5km from the top, the road become rougher and steeper. While I had wanted to camp on the other side, my numb fingers and toes started to persuade me otherwise. I passed a sign with Ak Baital 4655 written in cyrillic. It was an odd place to put the sign because it was still a few steep kilometres to the top! After the sign there was a small house. I was absolutely freezing and decided to take my chances to see if the locals could provide me with shelter for the night. At first I asked about pitching my tent beside their house and to my relief, they invited me inside. The residents were a husband and wife with three small boys. It really felt like a home at the end of the world. 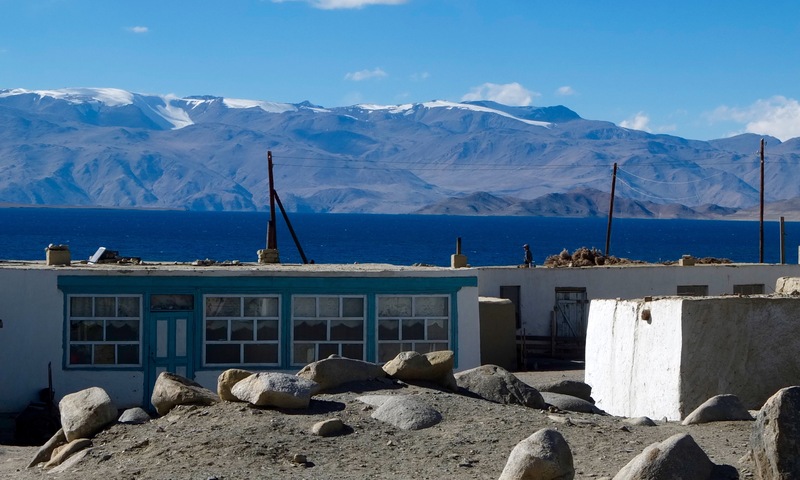 To live in such isolation, in a harsh landscape at 4400m takes a level of resilience that few of us could ever understand. The wood stove inside turned the tiny abode into a sauna. I was happy to feel warm and protected from the harsh weather outside. 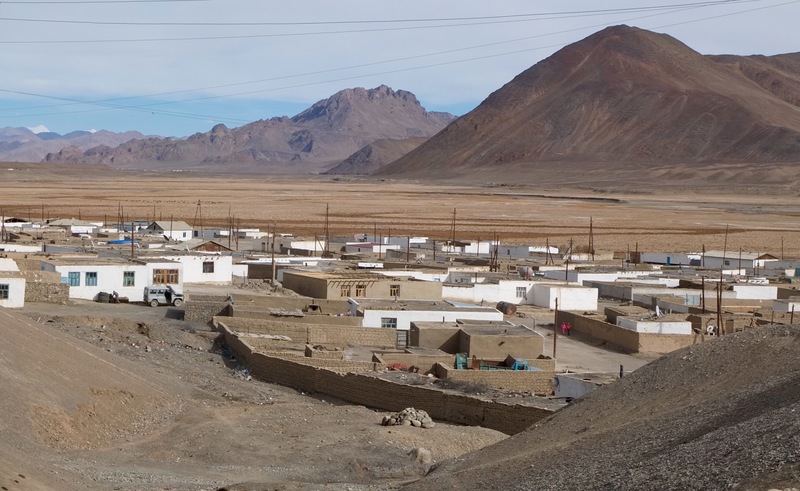 I shared what I could with the family – some onions and bread that I had bought in Murghab. We had chai and dinner together, while they little boys chased one another around the room and would occasionally stop to stare at the strange foreigner. Later on, we watched a cheesy Russian action movie where the language barrier was broken for me by acts of physical comedy. In these moments we would laugh together. I was completely exhausted and fell asleep early under the heavy blankets that they laid out for me. I was awoken by the father’s morning prayers when the sun started to rise. Out the window I could see a light dusting of snow on the ground. I thanked the family and started the final climb to the pass. The road was quite steep in parts, sometimes forcing me to push the bike for short stretches. The mountains were lightly dusted in snow highlighting the hues of pink and orange. 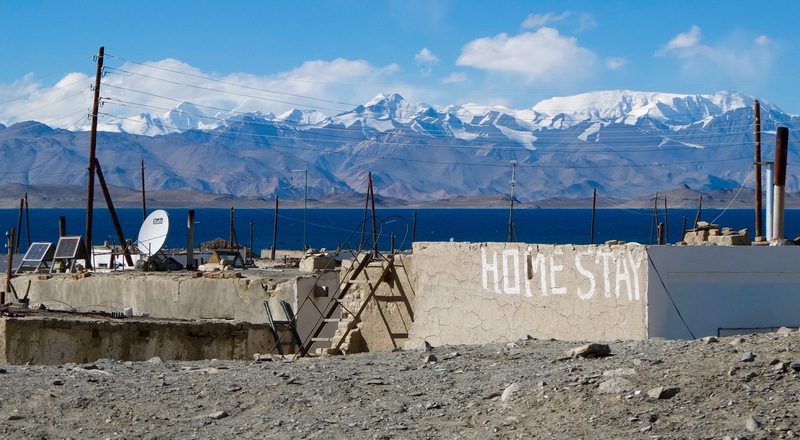 Soon, I got to highest point that I would reach in the Pamirs. Then it was time for some tripod and self-timer action. On the descent from the Ak Baital. I was almost too cold to stop and take this photo. I piled on every layer I had, feeling liked a puffed Marshmallow. Despite wearing enormous and thick lobster style mitts, my hands still froze. 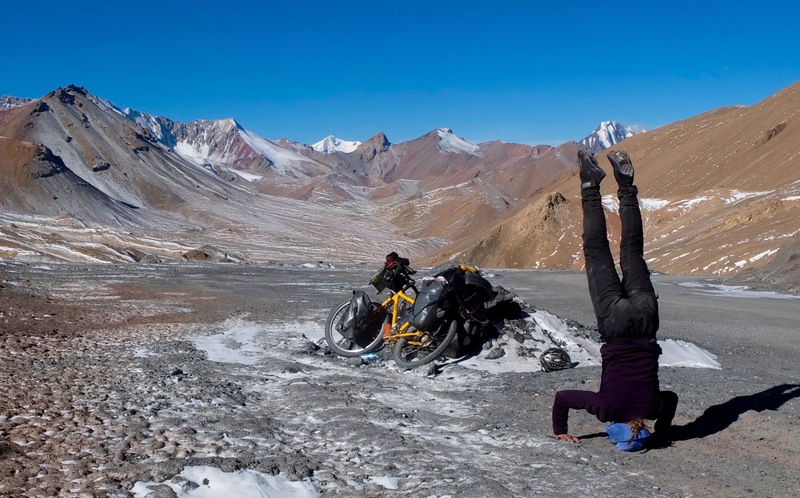 I was treated to about 15km of brain-numbing washboard at the bottom before hitting smooth tarmac that carried me all the way to the stunning lake Karakul. 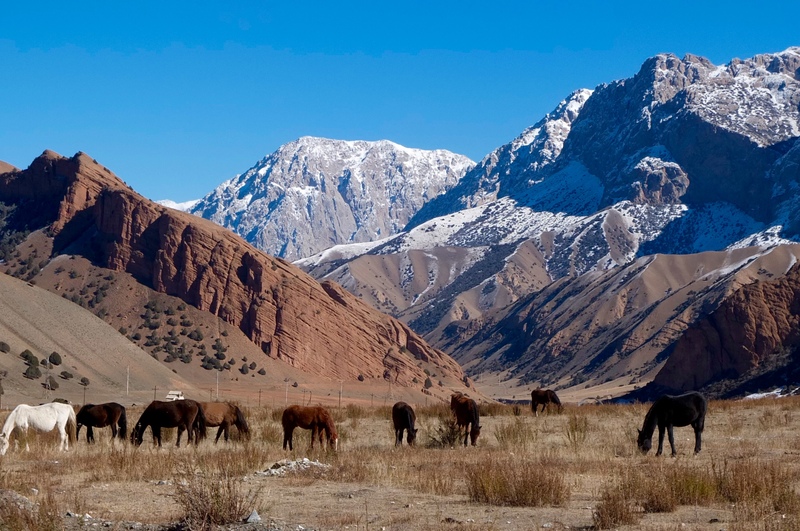 Karakul is a popular place name in Central Asia. 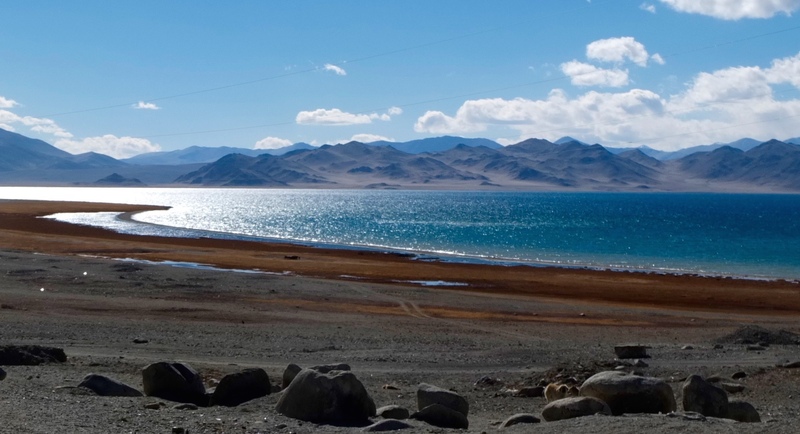 Karakul Lake simply means “black lake.” I don’t fully understand why this particular lake was given such a name because of its brilliant blue colour. A sliver of bright blue appeared in the horizon and I could see that I was approaching Karakul. Its shimmering shore reached closer and closer to the road and behind it was a backdrop of dramatic snow-capped peaks. I have been blessed to have seen many wonderful high altitude lakes on this trip and this was one of the most beautiful. If it wasn’t so cold it would have made for some wonderful camping. 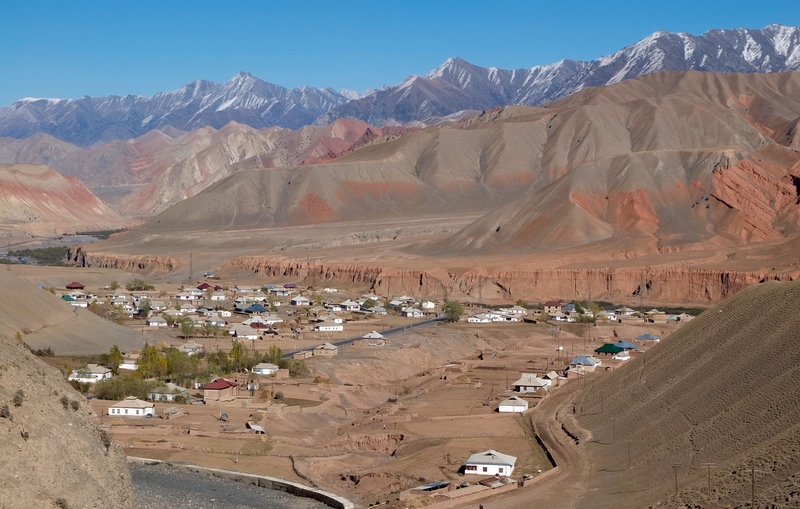 I entered the tiny village of Karakul built right next to the lake. I followed the first sign for “homestay” down a small dirt path. 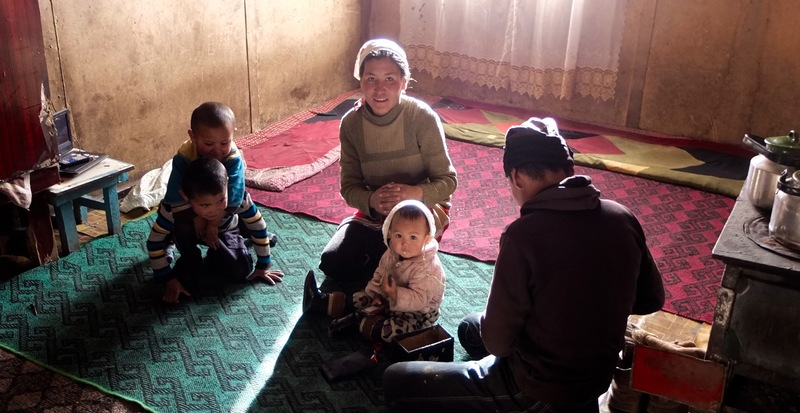 I waited around for the owners to arrive, but I was told eventually that they were away in Osh and I was taken to another homestay “Aigerim.” I was greeted by a friendly woman who could speak a little bit of English. I put my bike in their garage and carried my bags into the main guest area with cushions around a table and wood stove burning. I was feeling very tired and ended up passing out with blankets around me beside the table. Later, my hosts came in and I heard in my groggy state that another tourist had arrived. In walked Gordon, a motorcyclist from the UK. He was surprised to see me when I suddenly woke up, still half asleep and said hello. We started chatting and didn’t really stop for the next few hours. To say Gordon was passionate about motorcycles was an understatement. He has built a career out of it – writing for various publications about his trips on vintage motorbikes and acting as a representative for brands such as India’s Royal Enfield (originally from the UK). On this trip he was riding to Vietnam on a 1941 Matchless. With the current temperatures, the motorbike required a fair bit of daily maintenance just to keep it on the road. My plans to leave the next day were once again thwarted by some suspect buttered potatoes. It was devastating when I was served the exact same thing for dinner the following night, which I avoided at all costs. 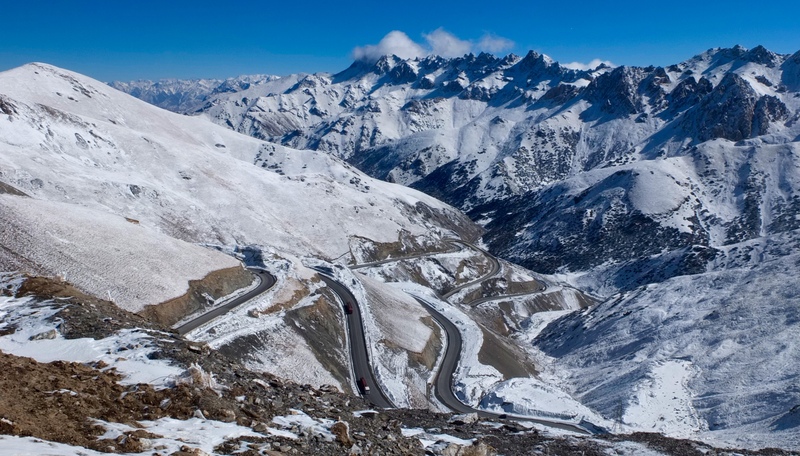 The next day I would leave Tajikistan via the 4280m Kizil Art Pass. The sight that greeted me the next morning was concerning. The mountains in the distance were completely covered in snow, the sky thick with grey cloud. For a moment, I thought twice about leaving, but didn’t fancy spending another night in Karakul or eating more buttered potatoes. I started the climb towards the Uy Bulak pass at 4232m. Since I was already close to 4000m at Karakul, I didn’t expect it would be too much effort and it was less than 60k to the border. 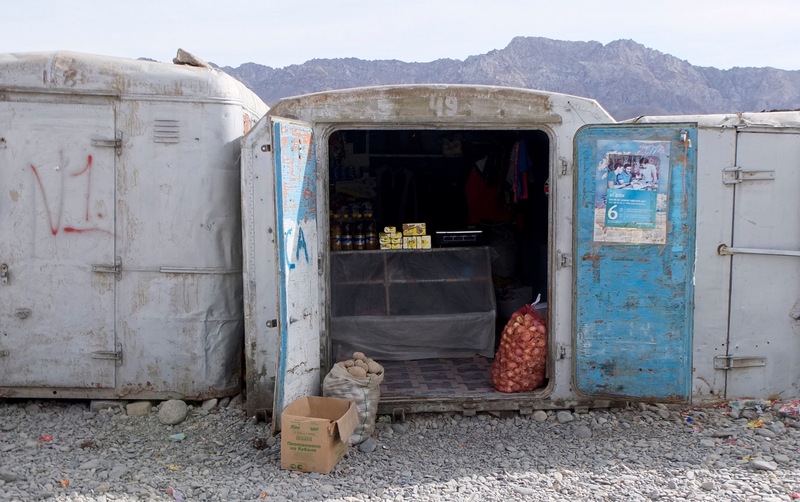 I had heard about a teahouse on the other side of the Kizil Art Pass where cyclists could seek shelter if they needed it. I knew that I had to reach this house to avoid a frigid night of camping at a high altitude. The closer I got to the pass, the more the skies darkened and suddenly I saw light flurries of snow. This is when I thought about turning back. I knew that I had a very remote stretch ahead and if I got stuck in bad weather I may not see another vehicle to hitch a ride with. I decided to keep moving forward and take the risk. Once I got over the pass, the wind picked up and the snow got heavier and heavier. Wearing all of my layers, I still became numb with cold. Tapping into basic survival knowledge, I knew that the only way to attempt to stay warm was to keep moving. The landscape was very exposed and there was no where to seek shelter. By now the visibility had greatly reduced as the strong winds whipped snow in every direction. I pedalled on at a crawl, feeling myself curl into a little frozen cocoon. Then, through squinted eyes I saw a jeep drive beside me and pull over in front. When I thought I wouldn’t see a vehicle all day, it was a surreal moment. The vehicle had a roof rack for the bike and an empty front seat. In the back was an old woman and a very young girl. The driver rushed to help me with my bags and put my bike on the roof. 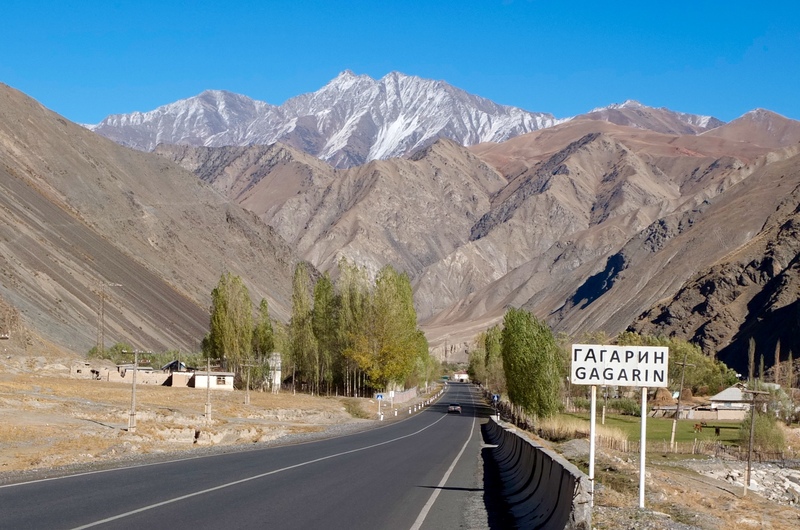 For a bit of money, the guy would take me to Sary Tash, the first town across the border in Kyrgyzstan. By now the road was completely snow covered and the wind was trying to push the vehicle sideways. The snow got deeper climbing up the pass. Luckily I never had to leave the vehicle the entire ride – the driver took care of the border formalities while I tried to get warm again. 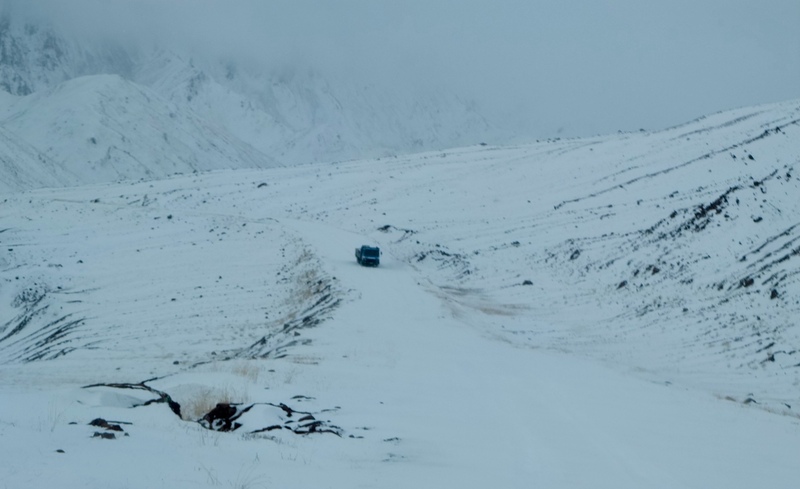 Once over the Kizil Art Pass, we descended into a winter wonderland with the 4WD van sliding all over the road. I could see an approaching truck doing the same. 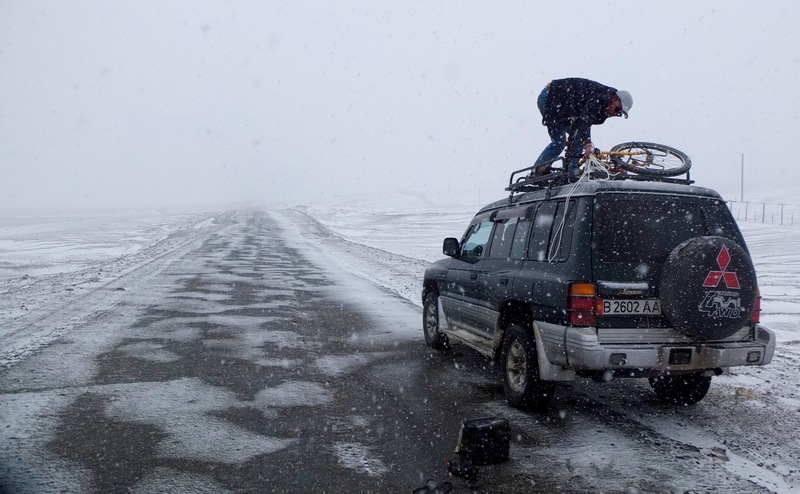 Not ideal cycling weather – even the 4WD vehicles were struggling. The house that I had originally planned to make it to that day. When we arrived in Sary Tash I requested that the driver take me to the pink hotel across from the gas station that I had heard about. 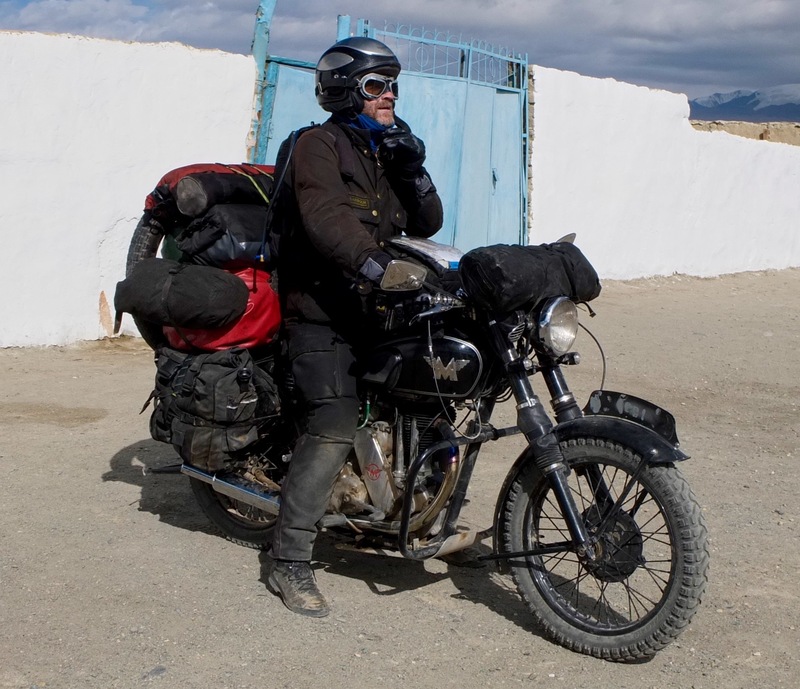 When I arrived, I saw Gordon again, the motorcyclists I had met in Karakul. I was certainly the last person he had expected to see! I only had two days left to Osh and a 2200m drop in elevation to look forward to. Sary Tash was still cold when I left, the heavy cloud obscuring the mountain views to the south. Before I could begin descending to Osh, I had a double headed pass to cross out of Sary Tash that peaked at 3600m. I climbed the snow-covered pass at a decent pace as luckily the road was clear. I was rewarded with a stunning view at the top. The descent was frigid, and I had to stop fairly often to warm my hands and run around to get the blood flowing to my feet. I found a restaurant in a small village close to the bottom of the pass and spent the next hour in a restaurant trying to warm up. After that, the road just kept going down and down and down. I descended from a frozen landscape to fall colours and sunny skies. I went from five layers of clothing to a long-sleeved shirt. I was elated and just couldn’t stop smiling. I passed some incredible coloured mountains that looked like they were straight out of a painting. 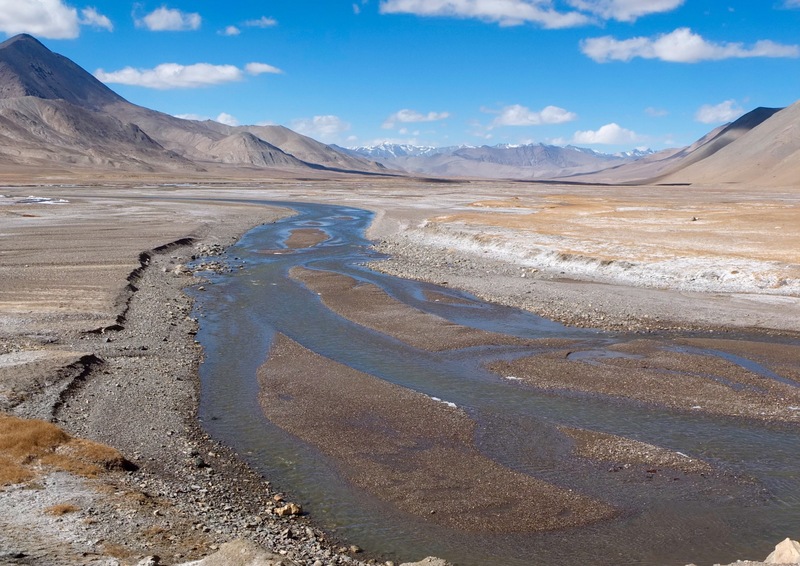 I passed a couple from the UK just beginning their Pamir ride in the opposite direction. I warned them of the snowy conditions ahead. I camped by the river that night, something I hadn’t done in a while now because of the freezing weather. Now, only one big climb to go before Osh. I was sweating heading up the final pass that was just over 2500m. On the way up I met a solo cyclist from the UK. He had a unique approach to his trips. While many round-the-world cyclists would make their route in one extended trip, this guy would pedal his line in short chunks. He had started from UK some years ago, would ride eastward for a few weeks and then start exactly where he had left off the following year. I eventually reached the top, where I was greeted by a group of excited locals that wanted their photo taken with me. Fun moments feeling like a minor celebrity. The 60km downhill to Osh wasn’t as swift as I had wanted, due to a powerful sidewind. But the closer I got, the faster the ride became. It was crazy to now be below 900m above sea level when two days ago I was freezing over 3000m. I found the Tes Guesthouse and pitched my tent in the garden. There I found Phoebe, that had her own struggles in the snow on the Kyrgyz side. 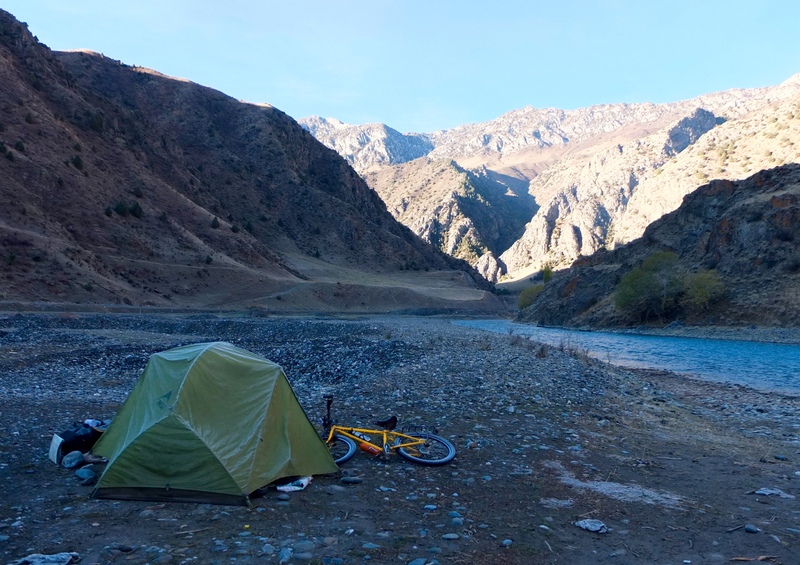 A day later I met Jochen, a German cyclist that I met on the Northern route in Tajikistan just before Khorog. He had been on the road for about 3 years and has covered around 60,000km. 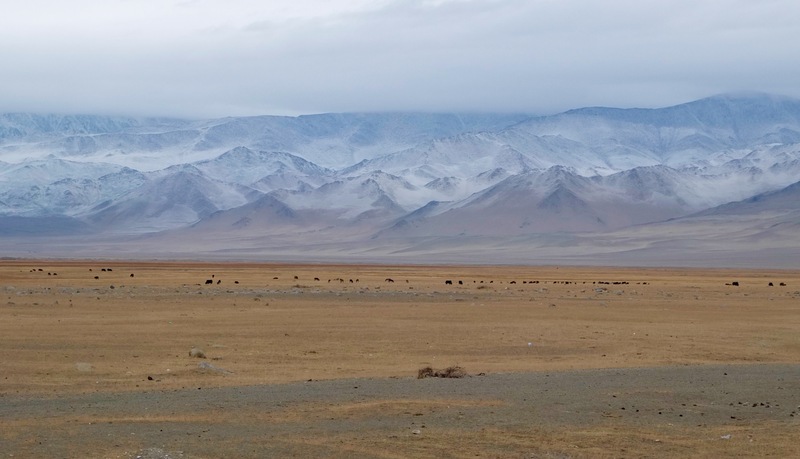 Jochen was headed to China and Phoebe would attempt the snowy backroads to BIshkek. My original plan was to ride all the way to Bishkek, but then I got word from my Vespa travelling friend Emma that she had been robbed in Bishkek and was stuck there longer than planned. She was flying back to the UK in five days to get a new passport. I was tired, wanting to see my friend again and not into dealing with more snowbound passes. So I took a shared taxi to Bishkek. Osh was the end of the line for my 2015 Asia tour. I spent my last few weeks in Kyrgyzstan relaxing and recovering in Bishkek. I felt so incredibly lucky to experience what I have on this journey across Asia’s silk routes. On May 7th I started my ride crossing Mongolia’s sandtracks. revelling in the country’s vastness and isolation. Then, I crossed the barren, scorching desert of Xinjiang, China. 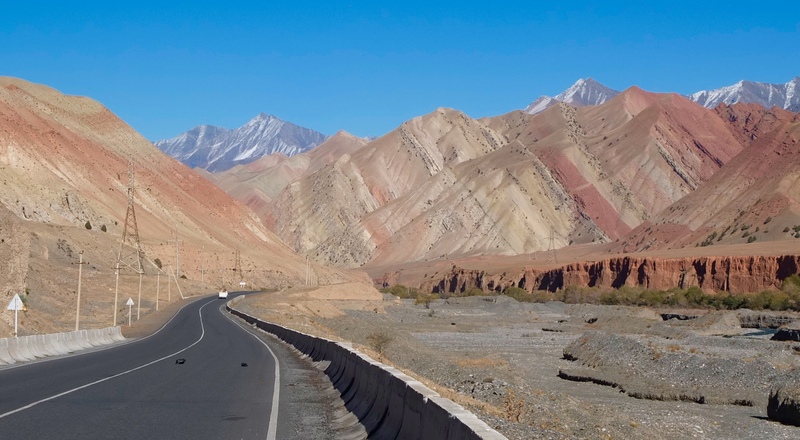 From here I chased the mountains into the paradise of Pakistan’s Karakoram Highway, the sublime and surreal Indian Himalaya and the Pamirs of Tajikistan and Kyrgyzstan. All the way, I followed Marco Polo’s ghost. The beauty of landscapes was equalled with its incredible people. Throughout the journey, I have been continually humbled by the amount of kindness I have been shown by total strangers. And now, what’s next? Leaving Marco Polo’s trails I will fly to Greece, for a two week ride around Crete. Next I will do some WWOOFing for the first time on the island of Paros. In mid-January I will begin the next chapter of my journey in Africa with a flight to Cairo, Egypt to begin the ride south to Capetown, South Africa. 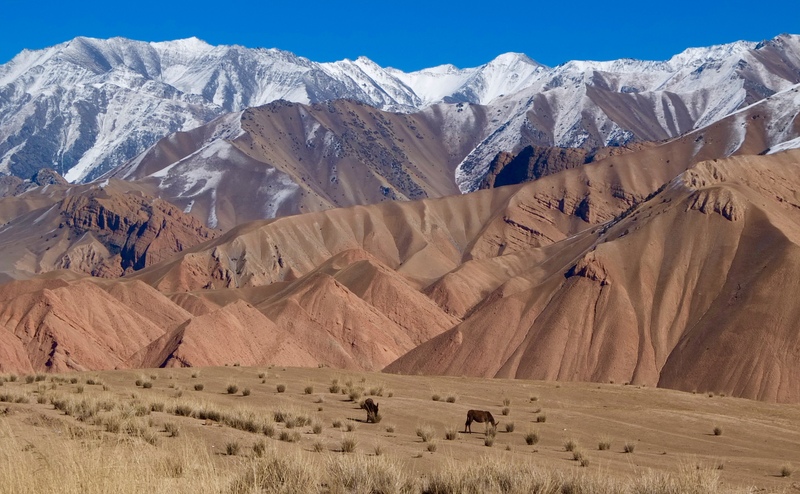 This entry was posted in Kyrgyzstan, Tajikistan by taraleighweir. Bookmark the permalink. Great pics of you on top of the mountain (standing on your head hahaha!). Love it! Loved following your travels. I’m so jealous, it must have been a wonderful experience. WOW!! What an adventure. All I have to say is go girl go……..